ARABIAN GULF — As U.S. tensions with Iran rose last week, 17 ships from the United States, United Kingdom, France, and Australia launched a major war game just 50 miles from the Iranian coast. HMS Ocean, a British amphibious assault ship carrying about 750 personnel, 150 of them Royal Marines, led the way. About 500 yards behind was the French destroyer FS Forbin, and about 500 yards behind was the U.S. destroyer USS Mahan. Another 500 yards behind was the Australian destroyer HMAS Arunta. Each carried about 300 sailors. Another destroyer, an Aegis cruiser, a supply ship, mine sweepers, patrol boats, and Coast Guard cutters made up the flanks. The ships cast dark gray silhouettes against a light gray sky and a bluish-gray sea, which was fairly calm, though the winds started to pick up. Although the ships moved about five football-fields away from each other, they were well within sight from the USS Mahan, where a small group of journalists, including from Breitbart News, observed the exercise. As the Mahan neared exactly 500 yards behind the Forbin, a young sailor on deck squinted into binoculars and shouted the exact distances as it closed in. Most of the sailors on the ship, clad in blue jumpsuits, appeared to be in their twenties. Driving the ship was 20-year old Seaman Rondo Parker, from Columbus, Ohio. The ship’s captain, U.S. Navy Cmdr. Marc Davis, explained to the journalists that the ships, which all belonged to the battle group currently tasked with regional security, don’t normally travel so close together. However, it was one part of the three-day exercise that began last Tuesday, focused on defeating and deterring a fictitious enemy force. In fact, it was just weeks before that Davis had faced down four Iranian fast attack boats that had sped so dangerously close towards his ship that he directed his sailors to fire three warning shots. One Iranian ship had gotten only 900 yards away — about as close as the HMS Ocean was at that moment, when sailors fired the warning shots from the .50 caliber guns mounted on the ship’s right side. The noise of the shots are “very distinctive,” Davis said. The Iranian boats then turned away. Although he said his sailors are “trained to do this” and that he did not have to calm any of them down, a young officer onboard privately told Breitbart News that the crew was “on edge” and “freaked out” the next day when they pulled near the United Arab Emirates and saw more Iranian fast attack boats. The incident appeared to be a part of the exercise commanders were now conducting, even as they denied it had anything to do with Iran. “It’s not a show of force to the Iranians at all,” the exercise’s logistical planner, British Royal Navy Lt. Cmdr. Ant Wallace, told the journalists aboard the HMS Ocean on the first day of the exercise. “The reason we’re doing this exercise, and I’ll stress this over and over again, is because it’s easier to do here than it would be anywhere else … The fact that it’s in the Arabian Gulf is coincidental, really,” he said. Commanders emphasized that the multilateral exercise, which had never been done before, was an opportunity to work on their mutual capabilities and enhance cooperation. 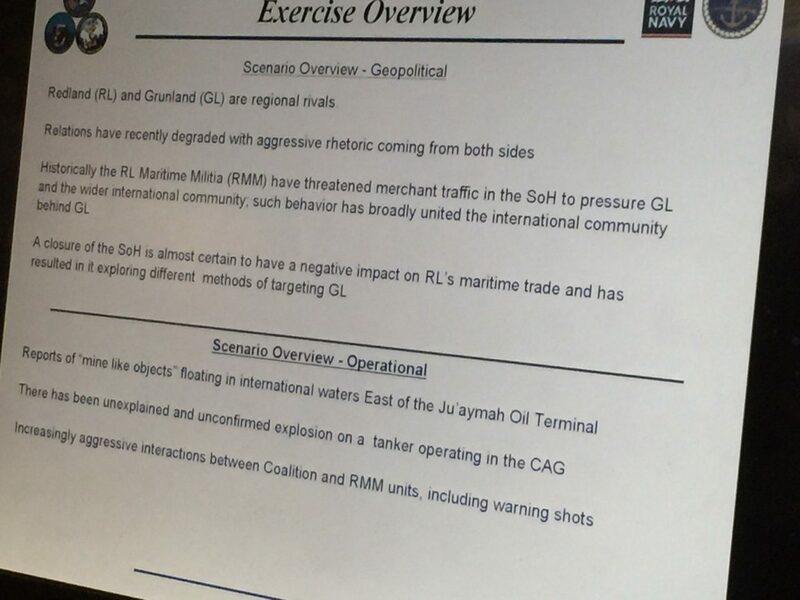 But the exercise featured two fictitious regional rivals, Redland (RL) and Grunland (GL), which bore close resemblances to Iran and the U.S.
“Historically the RL Maritime Militia (RMM) have threatened merchant traffic in the [Strait of Hormuz] to pressure GL and the wider international community; such behavior has broadly unified the international community behind GL,” an exercise briefing slide read. “Increasing aggressive interactions between Coalition and [Redland Maritime Militia] units, including warning shots,” it said. The day before journalists embarked on the Mahan, the crew had had an opportunity to fire all of its weapons, including a massive 5-inch turret deck gun akin to a cannon, another called the CIWS but pronounced “Sea Whiz,” a deck gun whose fire is so fast it sounds like a lawn mower engine, and its .25 mm guns, which are manned by one sailor. This time, Iranian boats were nowhere to be seen, even though Iranian leaders had slammed the exercise in advance, with its navy’s commander Rear Adm. Habibollah Sayyari warning, “They would not dare enter Iran’s territorial waters,” according to the Tehran Times. Although the exercise was planned eight to nine weeks ago, it coincided with an escalation in U.S. tension with Iran last week, and underscored the growing risk of a potential military flareup. On the Sunday before the exercise began, Iran fired a ballistic missile in defiance of international law. On Monday, Iran-backed Houthi rebels in the Red Sea rammed a boat into a ship belonging to Saudi Arabia, a U.S. ally in the region. On Tuesday, the exercise began. On Wednesday, National Security Adviser Michael Flynn said the U.S. was officially putting Iran “on notice.” On Thursday, Trump said “nothing’s off the table,” when asked about a military response to Iran. On Friday, he slapped a new round of sanctions on Iran’s missile program, while Iran said that it would not allow U.S. wrestlers into Iran to participate in a tournament after an executive order that barred visas from Iranians and seven other nationalities. On Saturday, Iran reversed its decision to bar the U.S. wrestlers from entering, but kicked off its own military exercises, defying the new sanctions and signaling continued defiance of the international community. The Trump administration has warned it may take further actions against Iran for its ballistic missile development. “Sooner or later, given the numerous tensions with Iran around the region, this escalatory dynamic risks spiraling into war,” the National Iranian American Council said in a statement. But other experts argue that not responding out of fear of escalation only plays into Iranian hands. “They want us to be self-deterred, thereby normalizing unacceptable Iranian behavior and encouraging further provocations,” said Alexander Alden, Senior Fellow for U.S. strategy at the Center for the National Interest. “The Trump administration is telling Iran,’You’re admonished,’and conveying that there is renewed resolve in Washington,” he said. Iran’s recent provocations follow a string of incidents during the last months of the Obama administration, despite the signing of a nuclear deal with Iran last year that was supposed to help improve U.S.-Iran relations. In September, an Iranian fast-attack boat came within 100 yards of a U.S. Navy coastal patrol boat. 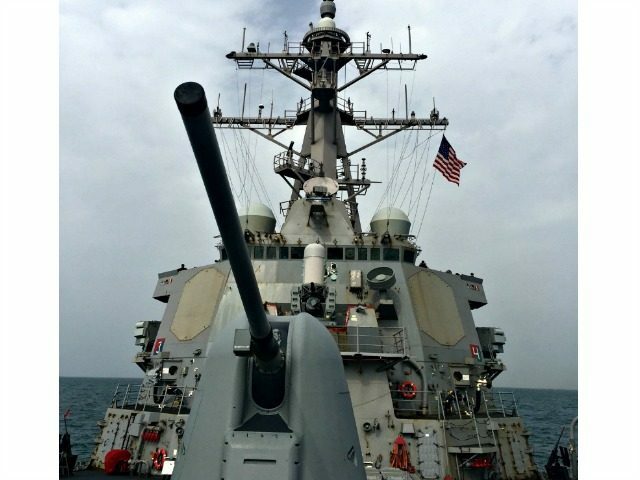 In October, Houthi rebels in the Red Sea fired missiles twice at the USS Mason, a U.S. destroyer. And last month came the incident with the Mahan. The number of “unsafe and/or unprofessional interactions,” as the U.S. Navy calls them, with Iran have risen in the last few years, despite the Iran deal. In 2015, of 327 total interactions, 23 were deemed unsafe and/or unprofessional. In 2016, there were 527 interactions, with 35 deemed unsafe and/or unprofessional. Officials say so far this year, there have already been eight interactions with the Iranians, with at least one unsafe and/or unprofessional interaction. So far, there have been no new guidelines for dealing with Iranian vessels at sea since Trump took office, according to U.S. officials. Uncertainty is now even higher, with Iranian-backed Houthi rebels showing willingness to ram into enemy boats. But despite the uncertainty, the sailors aboard the HMS Ocean, USS Mahan, FS Forbin, and HMAS Arunta kept busy with routine activities — working, doing Crossfit-like workouts in loading bays and empty hangars, eating, sleeping, watching TV, and socializing in recreational rooms. And across the different ships, every time a message would go out on the public announcement system, sailors would stop and listen, in case it applied to them. One message, on the Mahan, barked “Combat system casualty!” A sailor explained that despite the alarming message, it could mean something as mundane as a broken printer. 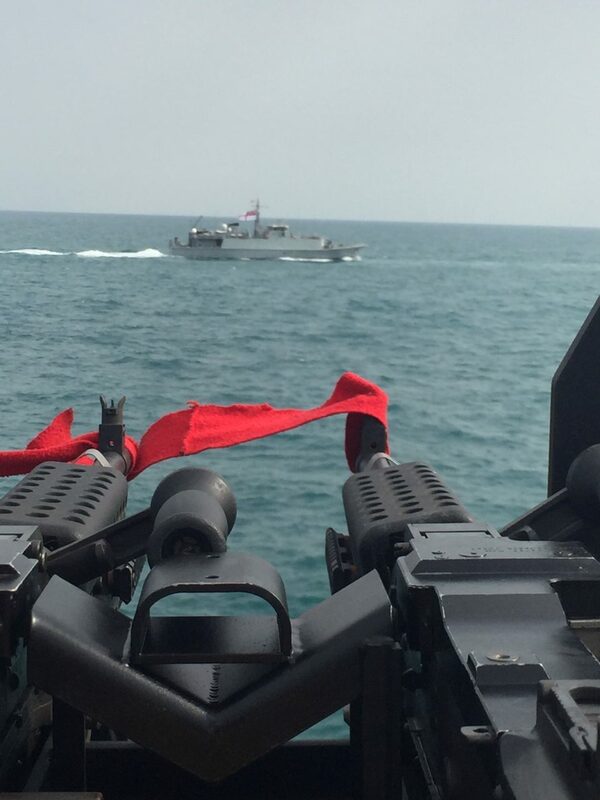 While naval commanders say their presence in the Gulf is to maintain stability in a tense region, they also acknowledge it leaves them ready to respond in case something happens. For example, one U.S. destroyer that was scheduled to be part of the exercise, the USS Cole, was sent down to assist the Saudi ship that was attacked by Houthis. “We both know it’s an unstable part of the world. 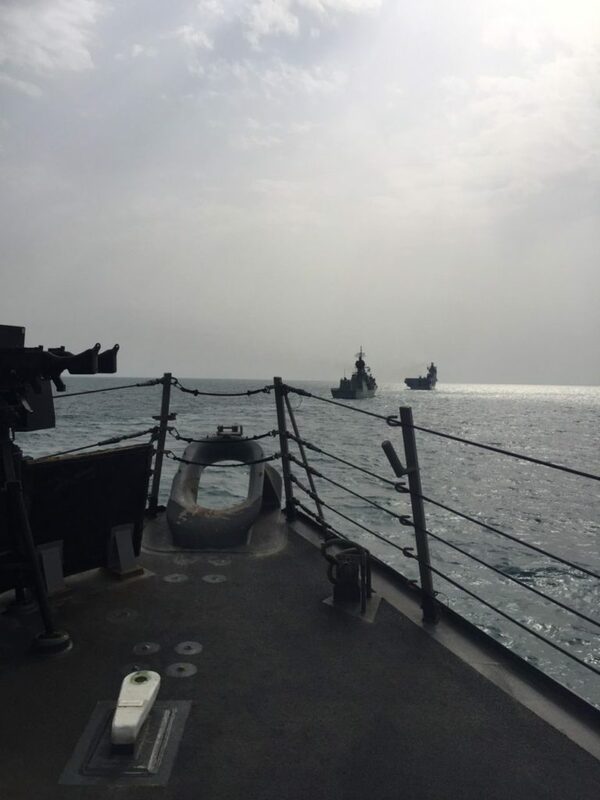 But one of the reasons for operating here in the Arabian Gulf is to make sure the instability we see on land doesn’t spill over into the maritime domain,” said Royal Navy Commodore Andrew Burns, who oversaw the exercise. 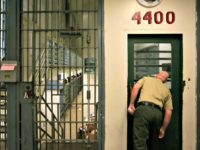 “As we all know, things can change very, very quickly and without much warning, and that’s why we have to continue a permanent and continuous presence in this part of the world,” he said.